Titanium Dioxide (2.6%) and Octinoxate (2%). Cyclopentasiloxane, Water, Cucumis Sativus (Cucumber) Fruit Water, Glycerin, Dimethicone Crosspolymer, Sodium Chloride, Niacinamide, Diethylhexyl Carbonate, Talc, Propylene Glycol, PEG/PPG-18/18 Dimethicone, Simmondsia Chinensis (Jojoba) Seed Wax, Rosa Canina Fruit Extract, Hippophae Rhamnoides Fruit Juice, Panthenol, Tocopheryl Acetate, Allantoin, Dimethicone, Methicone, Aluminum Hydroxide, Fragrance, Trideceth-9, Bisabolol, Lactic Acid, PEG-10 Dimethicone Crosspolymer, Citric Acid, Sodium Benzoate, Potassium Sorbate, Benzyl Alcohol, Phenoxyethanol. May Contain: Iron Oxides, Titanium Dioxide. In my opinion, this is NOT good for acne. Especially if you have sensitive skin. It burns, and hurts around my eye area and is overall just terrible, and breaks me out. However, I have very sensitive so I think this would work on someone that didn't have sensitive skin, and acne in general. A good foundation is undetectable. If a foundation is doing its job, your face should look naturally flawless. 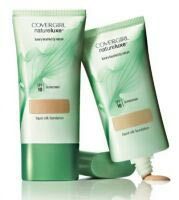 This is exactly what the CoverGirl Natureluxe foundation claims to be, and based on my research, many consumers of this product agree. After trying the product for myself, the amount of people who reported a pleasant experience with this product surprised me. I am not a very creative or artistic person, but their is one form of art that I am good at, the art of makeup. I don't wear makeup most days, and I don't wear it to make myself look better. To me it is the only form of art that I truly enjoy making. Ever since my friends discovered my talent for doing makeup, in the 9th grade, I have been doing their makeup for semi-formals, homecomings, and even proms. I quickly became the person that everyone went to when they wanted their makeup done. Due to the amount of 'clients' that I have had throughout the years, I have been fortunate enough to be able to test out many different types of foundations, allowing me to know a good foundation when I see one. Every product has pros and cons, but this product had too many cons for me to consider repurchasing. Cons:The number one problem that I had with this products was that it oxidized on my face overtime. When it comes to foundation, oxidation means that the product has changed color. 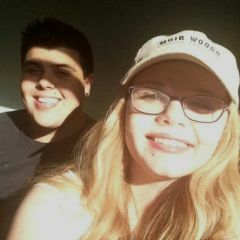 When I leave my house in the morning my face matches the rest of my body, but when I come home in the afternoon my skin is at least three shades darker then the rest of my body. One time I came back from school and my dad asked me if I had been outside all day because it looked like I got a 'serious tan'. Usually putting a primer on the skin before applying foundation can keep it from changing colors. This is similar to putting primer on a wall before painting it so that the paint sticks well, but in this case, not even a primer could help with the color change on my skin. Another problem I had with the foundation was that it made my skin look oily. I have very dry skin that barley produces natural oils. Making my skin look oily is a very hard thing to do, but yet this foundation managed to do it. The last thing that put up a red flag was the smell of the product. In the reviews I read beforehand, many people raved about the wonderful cucumber smell of the product, but when I applied the product to my skin all I could smell where the chemicals that went into this foundation. The strong chemical smell was accompanied by a musky fragrance that was overwhelming. Dealing with this smell all day made me repeatedly think about going into the bathroom and washing all of the makeup off my face. Pros: There where some things that I loved about the product. I loved how it felt light on my skin, as though nothing was there at all. It also didn't clog my pores like most foundations do. I was able to wear this foundation to a 12 hour dance competition and have no pimples emerging afterwords. This is nothing short of a miracle. It was also very easy and fun to apply. Most foundations that I have dealt with previously dry before I get a chance to apply it to my entire face properly, but this one allowed me to finish blending my entire face before it dried. I am planning on finishing my tube of this foundation because I don't like to waste, but I will definitely not purchase it again. There are many drugstore foundations, for cheaper, that work better. I would advise you to invest your money elsewhere. Oxidation in a product is a very individual experience, hence your experience being different from others. Individuals with 'oily' skin tend to have more oxidation issues with foundation than others. For individuals that tend to have oxidation issues, one trick is to buy foundation in a lighter shade, expecting oxidation, hoping to have a more 'normalizing' outcome. Another option is to use a primer that serves as a barrier between the foundation and your skin. Any skincare done prior to the foundation can also affect the outcome of any foundation, so that needs to be considered as well. Hope this helps. Good color match Minimizes pores Sufficient coverage for light acne & minor dark spots Feels weightless Goes on smoothly Feels soothing and doesn't cause irritation or breakouts A little goes a long way A bit more expensive than the lowest-price foundations (but worth every penny to me!) Still need a concealer for the darkest spots I am 61 years old and have had very oily skin with mild-moderate non-scarring acne since I was 12. It's much improved since menopause, but I still have occasional breakouts and very large pores. This is by far the best foundation I've ever used! It does a great job of minimizing pores and gives my skin a lovely glow. Almost daily now, someone compliments me on my beautiful skin, which just blows me away after so many years of wanting to hide! I sure hope enough people use it so Cover Girl will keep it on the market for a very long time. Looks so natural! Covers up well Moisturizes You can find a color that fits your skin Does not break me out Smells good Cheap (compared to other big brands) Light, but with concealer, its fine It works best with a bit of pressed powder I AM IN LOVE WITH MY NEW FOUNDATION. It just looks natural !! By boyfriend commented on how my skin just glowed !! I told him about the regimen but also about this awesome make up!! -Does not cause breakouts -smooth, silky finish -matte -perfect for dry AND oily/acne prone skin. -ingredients are healthy for you skin -smells good light coverage I recommend this to everyone! This is the best foundation I've ever tried. I LOVE it. It's the only foundation that has ever had a perfect match for my fair skin tone. I never thought it was possible! It gives your skin, a smooth, soft, airbrush finish. Your skin looks silky and glowing, yet still matte. Your skin looks soft and moisturized, yet not shiny. Minimizes pores. Perfect, it looks soo nice! (I do put powder on my oily areas though, to give a perfect finish, and make the foundation last.) The natural ingredients are actually healthy for you skin, and will not make you breakout in your oily areas. And it makes the dry areas look softer, and less dry. Perfect for dry and oily/acne prone skin. The coverage is actually pretty good, but I still need a little concealer for my really red areas. I apply this with a sponge (which I wash frequently, as to prevent bacteria). Then I put on concealer. Then powder. And just a note, make sure you wash your hands before applying makeup. If there's bacteria and junk on your hands, it will cause more acne. .doesn't make me break out .is natural and not made made with harsh chemicals .matches my skin good .covers up my some of my acne covers my acne scars .smells kinda funny .didn't cover all of my acne .expensive for a drugstore brand Get it because after trying tons of different foundations this was the only one that didn't make me break out! I use powder on top of it to help my skin from looking greasy. - SPF 10 included (a must-have for going out) - Contains Jojoba extract - Moisturizing (especially for dryer skin) - Sheer, light-medium coverage - Easy to match colour - Easy to apply to skin - Can double-up as a concealer - Smells nice - Covers acne scars and redness well - Doesn't cause breakouts (I have been using it daily for over 3 months and haven't had any problems thus far) - Can become greasy-looking later in the day (need to blot face with kleenex throughout day OR use light powder on top) - Not for heavy coverage (better for just covering up acne scars/pigmentation... but not necessarily active acne) - A little bit expensive for drugstore brand, but still more cost-effective and worth it than department store makeup I LOVE this foundation! It is my favourite foundation that I have across since I first started using the Acne.org regimen (over two years ago). It is excellent for a nice and sheer makeup (not heavy on your face) that still gives you a light-medium coverage on your face. I use it particularly to cover up redness (from hyperpigmentation) and some of the acne scars I have left on my face, and also to even out my skin tone. It's great b/c it also contains SPF protection which is extremely important when you're putting your face in the sun. It's easy to apply... my recommendation is that you use a stippling technique when applying it using a proper stippling makeup brush. Of course, you can use your fingers also but I've found the best way is to use stippling for the perfect application. Afterwards, your skin looks flawless and beautiful without having to feel like you have chunks of makeup on your face. I really recommend this! Good luck! -smooth, matte finish -has spf 10 -as far as I know, does not cause acne -easy to blend -covers zits well -contains jojoba extract -a little expensive for drugstore makeup This is an excellent foundation for covering acne and facial imperfections. It is easy to blend and does not make your skin look oily. It does not dry your skin out either, as well as protects your skin from the sun. It is not cheap, but your getting your money's worth if you purchase this!